Will Mario Kart 8 Sales Be Enough to Save the Wii U? This past Friday, Nintendo released one of its most anticipated games for the Wii U, Mario Kart 8. While there has been speculation that the game might end up producing the lowest sales figures in the franchise despite glowing reviews, it was off to a good start in its first weekend. The popularity of the game even caused overloads of the company's "Club Nintendo" website as release-day purchasers attempted to register the game to take advantage of a free-game promotion that the site is running. Mario Kart 8 shows every indication that it might be the hit that the Wii U needs. Its predecessor, Mario Kart 7 for the 3DS, sold 1.54 million units in the most recent fiscal year and has recorded 9.62 million sales in its three-year lifetime, while Mario Kart Wii sold 1.27 million units in the fiscal year and has recorded 35.5 million sales in six years. The demand for "Mario Kart" games is certainly there. With this in mind, what are the prospects for Nintendo moving forward? 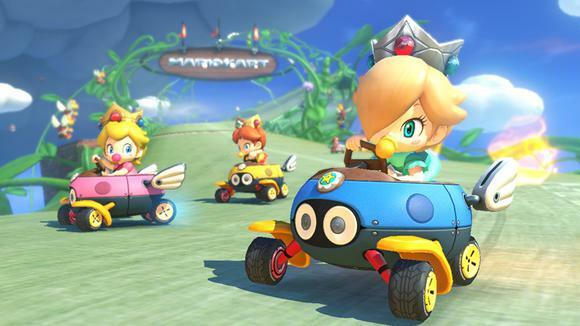 Is Mario Kart 8 the draw that the Wii U needs? This provides a compelling reason for some "Kart" fans to buy the new game, especially since the game introduces a few new features, refines popular ones, and allows players to revisit iconic tracks from previous games in 720p HD at 60 frames per second for the first time. While some games gradually build up sales and become hits in the long run, Nintendo wanted to make sure that Mario Kart 8 was a hit right out of the gate. The company is offering a promotion through its Club Nintendo service that allows players to choose a free game from a list of first-party titles upon registering Mario Kart 8 or downloading it from the Nintendo e-Shop. The promotion is set to run through the end of July, encouraging gamers to buy early to take advantage. If the slowdowns and server errors experienced by the Club Nintendo site on release day are any indication, a significant number of gamers are trying to take advantage of this deal. While the problems were short-lived, it's likely that the site will continue to see a significant amount of traffic as additional sales accumulate over the next two months. Even though games such as New Super Mario Bros U (with 4.16 million units sold to date) and Super Mario 3D World (with 2.17 million units sold to date) have captured a respectable amount of the Wii U's install base, it's likely that Mario Kart 8 will start closing the gap on these earlier titles fairly quickly. In addition to providing a must-have game for those who already own a Wii U, some within the company believe that it could be a catalyst for Wii U sales as well. Several Mario Kart 8 bundles have been introduced around the world, allowing potential players to pick up a console with the game preinstalled and ready to play. While previous bundles (such as console bundles released with the Legend of Zelda: The Windwaker remake) failed to have a significant impact on console sales, the games that were bundled in those deals didn't necessarily have the appeal of Mario Kart 8. Is it time for a Wii U recovery? Amid news that the Wii U actually outsold the PlayStation 4 recently in Japan (where Sony's console has been notoriously struggling) and increasing hype for both Mario Kart 8 and the upcoming Super Smash Bros, this year will likely be the best one yet for the system. The company has put to rest rumors that it would announce a Wii U successor at this year's E3 conference, indicating that it isn't giving up on the console just yet. The Wii U will likely never reach the sales figures of some of the company's more popular consoles, but games such as Mario Kart 8, Super Smash Bros, and the upcoming Hyrule Warriors could help it to build a solid foundation similar to that eventually found by the Game Cube; while the console only sold 21.74 million units in its six-year lifespan, it released a number of now-classic games and served as a starting point for the development of the massively successful Wii. Watchers should pay attention to upcoming Nintendo financial reports to track both Mario Kart 8 and console sales. This could be the beginning of a major growth spurt for the Wii U's install base. The article Will Mario Kart 8 Sales Be Enough to Save the Wii U? originally appeared on Fool.com. John Casteele has no position in any stocks mentioned. The Motley Fool has no position in any of the stocks mentioned. Try any of our Foolish newsletter services free for 30 days. We Fools may not all hold the same opinions, but we all believe that considering a diverse range of insights makes us better investors. The Motley Fool has a disclosure policy.